Bignay (aka. 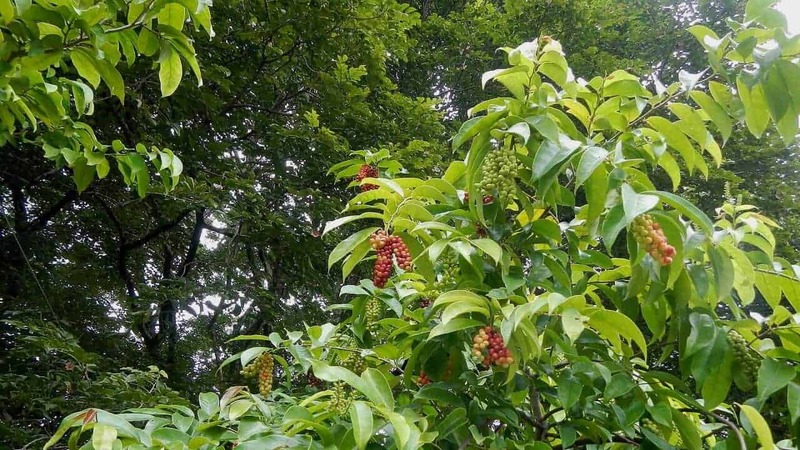 wild cherry, currant tree, mamao dong) produces small berries that are sour and cranberry-like when immature, but tart and sweet when ripe. Ripe fruits have also traditionally been used to treat gastric intestinal upsets, while leaf extracts have been found to possess antioxidant, liver-protective and anti-diabetic properties. 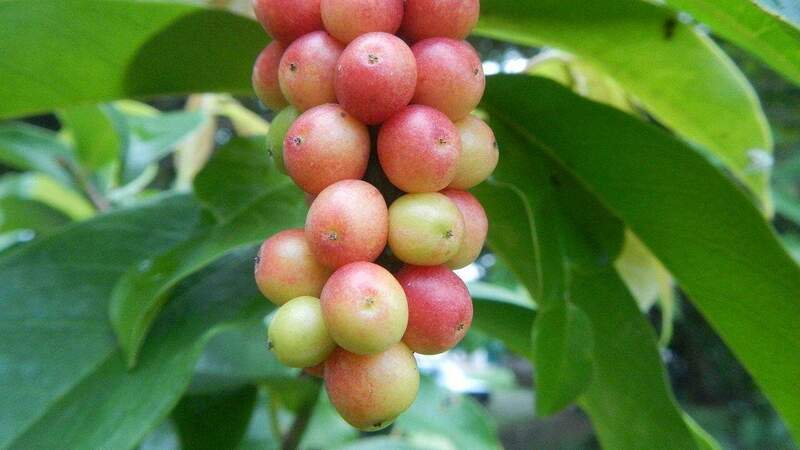 Outside Australia, Bignay is also native to India and Southeast Asia. This tree fruits from July through September, producing grape-like clusters of 20-30 fruits, each half an inch in diameter, containing a single seed. Berries ripen unevenly, turning greenish white to deep purplish red, creating a colourful display throughout the season. They may be eaten raw or used in jams, jellies, syrups and wine. Bignay fruit sauce is sour and delicious when served with fish. 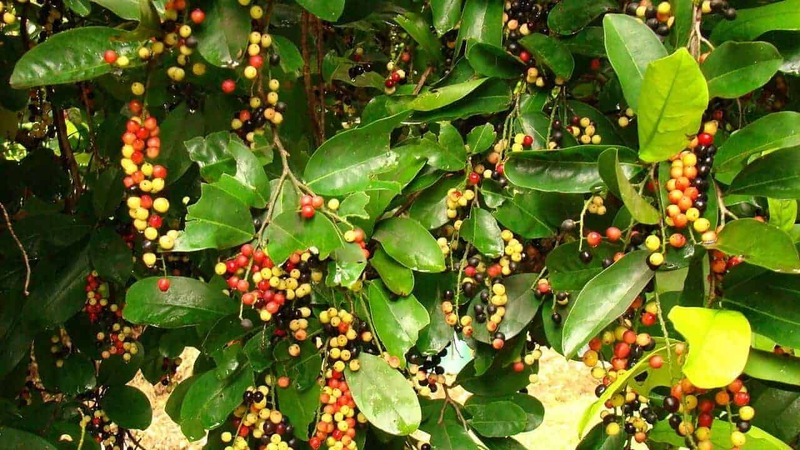 Bignay leaves are tart and may be used to flavour rice, salads, vegetables dishes and meat stews. Bignay leaf tea is also consumed throughout Thailand, Singapore and the Philippines. Flowers are small and petal-less, with male and female flowers borne on separate trees, but isolated female trees can still fruit abundantly. This medium tree does well in full sun or part shade, and can handle a range of soil types. Fertilise 2-3 times a year with a general purpose fertiliser during the warm months. Pruning best done in Spring. Protect from frosts and drying winds. Leaves are glossy and dark green, providing dense, attractive shade, year-round. Bignay can be grown tall and erect up to 8m, or kept short and shrubby with regular pruning. Makes an excellent shade tree in the backyard or front garden. What’s this black stuff growing on my Bignay leaves? Your Bignay tree may have mealybugs or scale – the black stuff may be sooty mould growing on their excretions. Infested parts may be pruned off or treated with horticultural oil. Avoid over-fertilising, as both mealybugs and scale are attracted to plants fertilised with a lot of nitrogen. Why is my Bignay tree not fruiting? My Bignay is covered in ants! Do I need to be concerned? No, but if you notice the leaves browning and dying back prematurely, the ants may be farming aphids on your tree. Either manage the aphids with neem oil or lady beetles, or manage the ants with repellents or physical removal.